With the frigid Winter weather that's hit that nation recently it's even harder to keep your skin hydrated and chap free this season. I've been trying several different skincare remedies but have found only one product that truly works that I picked up at my local Walmart for $7. It's the Palmer's Cocoa Butter Cream. Cocoa Butter has been used for years as an anti-aging, skin tightening and skin healer as it is high in antioxidants which helps fight off free radicals. Cocoa Butter is high in fatty acids so it hydrates the skin deeply from the inside out. This is why it works through this polar vortex. Cocoa Butter is widely used by pregnant women as well as it's been proven to help prevent and reduce the appearance of stretch marks and scaring. It's suitable for all areas of the face and body. I apply the Cocoa Butter in the morning after my normal skincare routine of cleansing, toning and moisturizing and then top coat it with a small amount of Palmer's. My face stays hydrated all day and it doesn't clog pores. I have noticed tighter skin and smaller pores and a more even skin tone from using this miracle in a jar. It's amazing for after shaving as it keeps your legs hydrated all day. I apply to my entire body again before bed including my hands and feet and seal the butter in with socks for a deeper treatment. 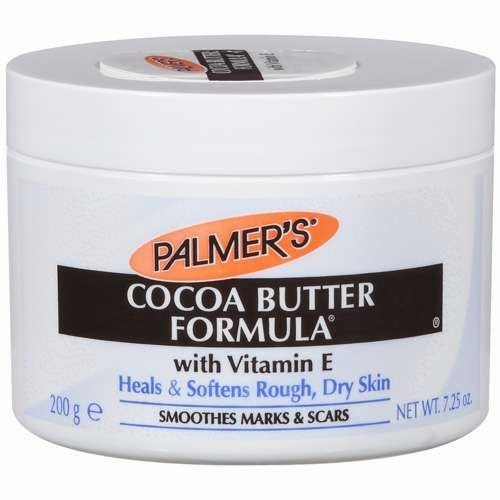 Cocoa Butter has also known to help skin irritations such as eczema and dermatitis. You can purchase the Palmer's Cocoa Butter Cream in different forms; in a tube for your lips, in a tube for your face and body and also in a 7.25oz Jar which is the best formula as it's the most concentrated of the three. Palmer's is available at Target, Walmart, Loblaws in Canada. Get hydrated!